Gregory Fuller "Greg" Kite is an American retired professional basketball player. A 6'11" center from Brigham Young University, he was selected 21st overall by the Boston Celtics in the 1983 NBA Draft. 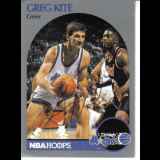 As a Celtic, he won two championship rings in 1984 and 1986 before being waived by the team in early 1988. He then played for the Los Angeles Clippers and several other teams since, including 12 games with the Charlotte Hornets in that team's inaugural season in 1988. He ended his NBA career in 1995 with career averages of 2.5 points and 3.8 rebounds per game.